This site is under long-term construction! The links below with Live! Underneath have content. Go to the Windsprint page and click one of the Building Photos pages for pictures of my Windsprint under construction! My name is Robert Lundy and this Web site is for people who love boats and especially those that love to build boats. This Index page will be updated as new things are added, or I actually finish building a boat. This picture above will show my Bolger Windsprint, a 16' Lug rigged sailboat at its most recent photographed stage. Note that while the links above may have a page loaded, any useful content may be days (..or months, or years) away. 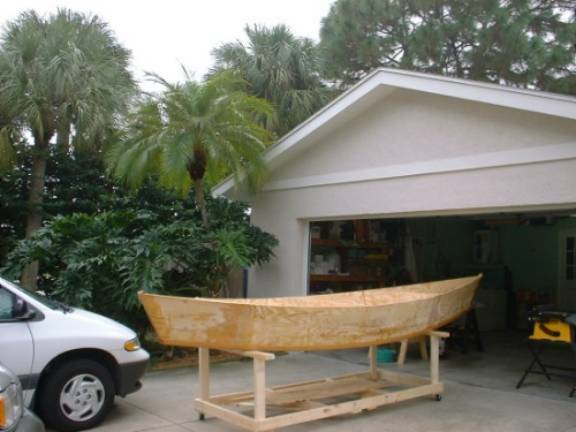 September 15, 1999-The plans for both the Bolger Windsprint and 15'6" Workskiff arrived today from H.H. Payson & Co. Placed them in the special place with the Micro plans I've had since about 1990. October 1, 1999- The building has started! Go to the Windsprint link above for building logs and pictures. Not much in the way of pictures yet. October 10, 1999- Started this Web Site! November 4, 1999- Got some construction photos up on the Windsprint page! Check out the "square scarf". Building logs lagging the photos. November 14, 1999- Polished up the site (fixed the giant jpegs), joined the Boat building Webring, added a page 2 of construction photos to the Windsprint page. The bottom is on. November 30, 1999- Added to the Windsprint construction photos page (now includes a page three). Pictures of the "Boat Cart" are up. Building Log has been brought up to date. December 1, 1999- Changed the background colors from the nice "Wood grain" for this dull gray stuff after several complaints about not being able to see the text. A valid complaint now fixed. December 5, 1999- Added some stuff to the links page. Added pics to the Boatyard page and the Other Boats page. Yep, went out and bought my daughter (ahem!) a digital camera for Christmas. January 6, 2000- Added another pic of the "epoxification" job to Windsprint/Construction Photos page 3. Fixed some more MS Word 2000 generated bizarre link code. June 15, 2000- Got to the stage where the hull is completed, lost my mind and bought a large express cruiser. Windsprint safely ensconced in my garage awaiting attention later this winter-stay tuned!